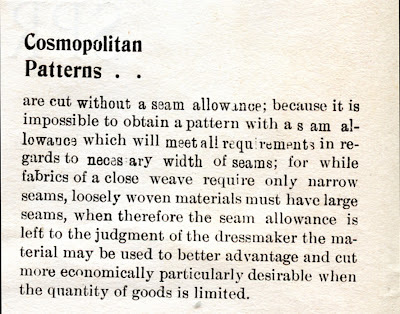 1898 for certain, as this pattern is listed in Cosmopolitan's Spring and Summer Catalog for that year. Patterns for utilitarian garments tend to stay in the backlist for a while, so this may have been offered a few years earlier and later. After Universal's Working Blouse, this is probably one of the oldest patterns I own. A large number of old store stock Cosmopolitan patterns came on the market in the early 2000s and I acquired several of the more utilitarian styles. Last summer I finally had the time to start making up this shirt. I decided to approach this as a maker in 1898 would. I assumed that the pattern was accurate and usable and that it wouldn't be necessary to make up a muslin to test the pattern. But I also decided to take some measurements in order to forestall surprises and to use inexpensive fabric. I removed the pattern pieces from their envelope for the first time since they'd been originally packaged 112 years earlier. Both the envelope and the pattern pieces were in very fine condition. 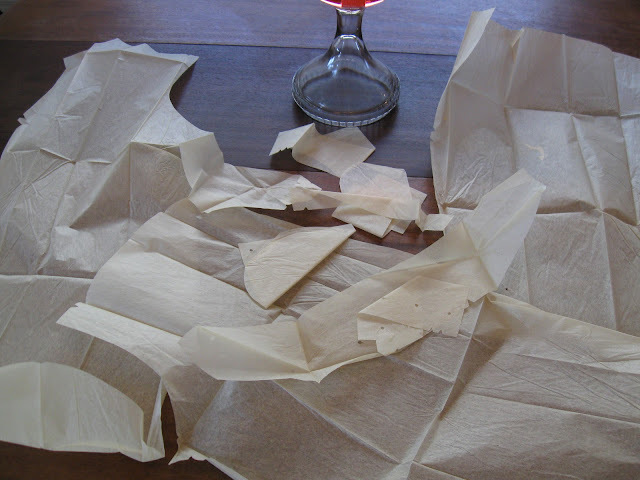 Here is what the eleven pieces looked like immediately after I'd unfolded them. The 19th century maker would have laid out the pattern pieces on the fabric and traced a solid line around them with tailor's chalk or a soft pencil. 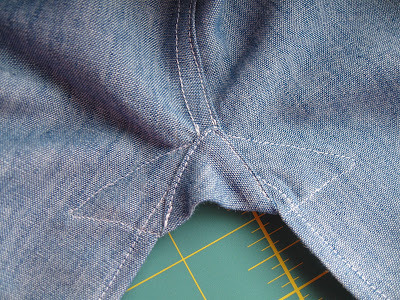 She would then cut outside this line to add the seam allowances. Because the actual stitching line has been traced in chalk, it's sufficient to cut the seam allowances by eye and trim them even during construction. 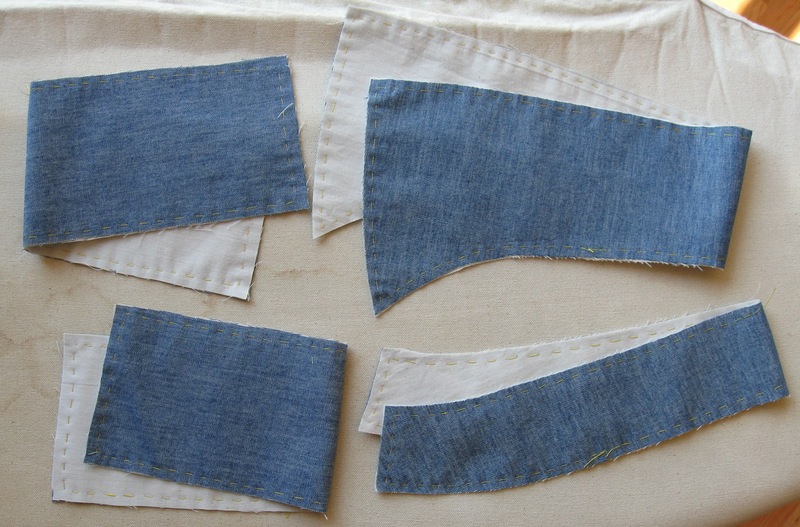 She could also have marked a measured seam allowance, usually a dashed line, and cut along this line. 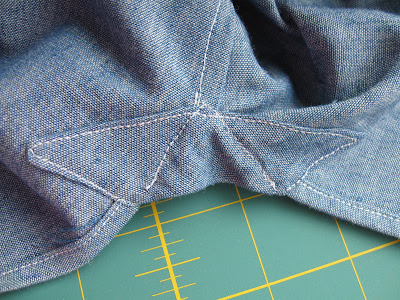 Adding your own seam allowances also allows you to use different seam allowances for different parts of the garment, and I'll come back to this idea a little later. 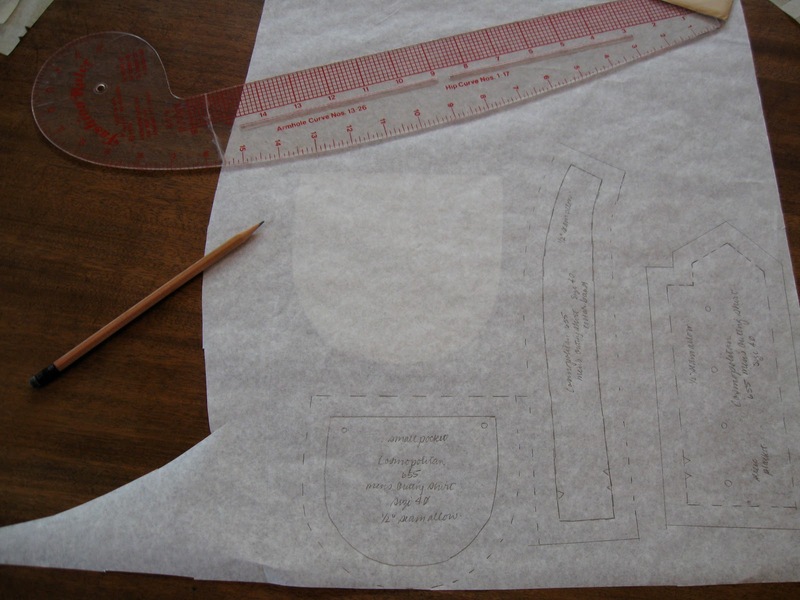 I never sew with patterns this old, so I rolled out my pattern paper and traced all of the pieces. 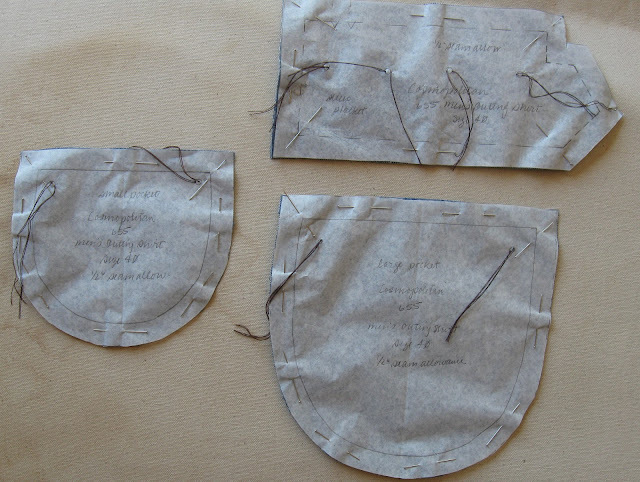 Note that the pattern pieces are placed under the pattern paper so that they're protected. It's quite easy to feel the edges of the pieces with the tip of your pencil and be guided by them as you trace. For speed, I use a ruler for drawing in any straight lines. You can see that I've added a uniform half inch seam allowance. 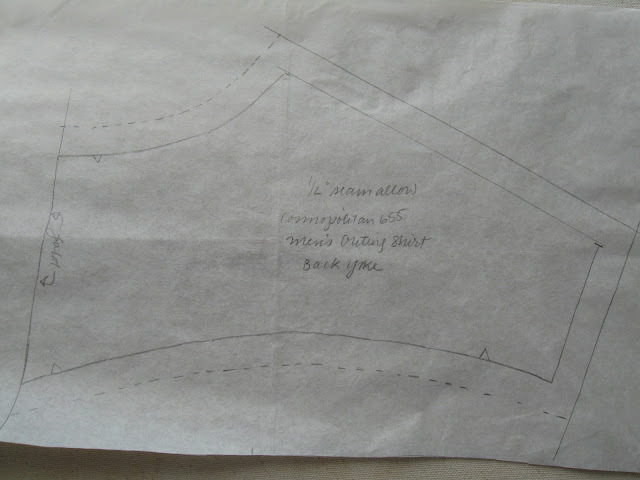 In fact, a better plan would have been to add half inch seam allowances for the shirt's side, yoke, and sleeve seams and quarter inch seam allowances for most of the other seams, since this would save having to trim these seams during construction. The pattern pieces show a reasonably comprehensive set of notches and perforations. I made up the shirt in an inexpensive chambray, one of the many fabrics recommended for outing shirts. My chambray was 54" wide, which I pre-washed in hot water. The instructions on the pattern envelope suggest that 3 3/8 yard of 36" fabric would be needed for this size 40 shirt. Here's the layout. Can you spot the mistake I've made? Look carefully and you'll see that I've laid out the front of the shirt along the selvedge. It should be laid out on the fold. It's my usual practice to cut my notches as short snips and to thread mark all other markings, so I did the same here. I use two strands of darning cotton and a millinery needle to make my thread markings. 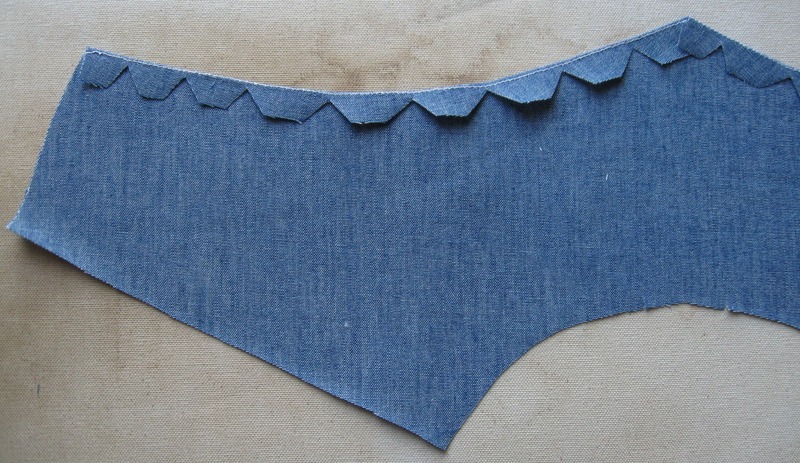 The instructions on the envelope (separate instructions sheets won't start showing up until the 1920's) describe how the pieces are put together, but the maker is expected to know what constitutes good shirt-making technique. For men's shirts the collar, neck-band and cuffs are almost aways interlined for body and sturdiness. 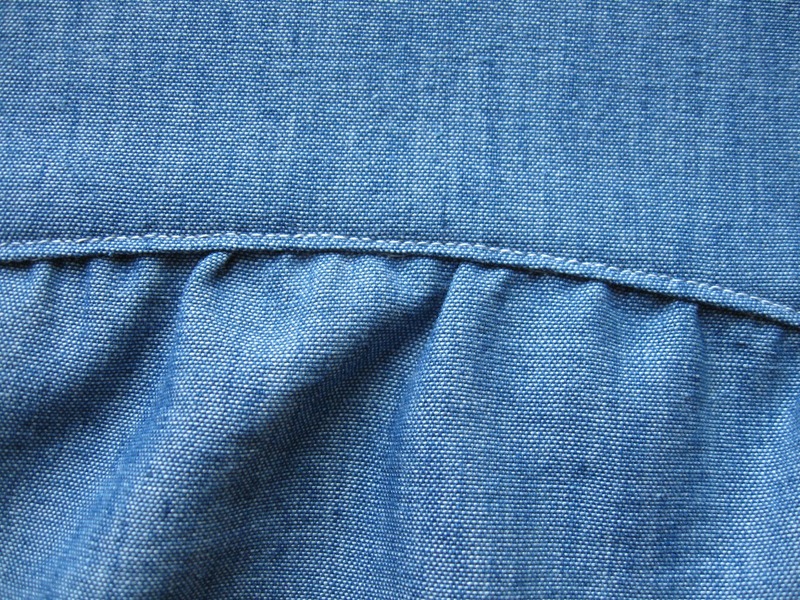 One of my Women's Institute books recommends using the shirt fabric itself for this interlining. There is something to this. When the collar wears thin it can be discretely darned to the interlining. (When this is no longer possible the collar can removed, turned over, and re-attached. Ask your grandmother how much fun turning the gentleman's collars was back in the old days.) 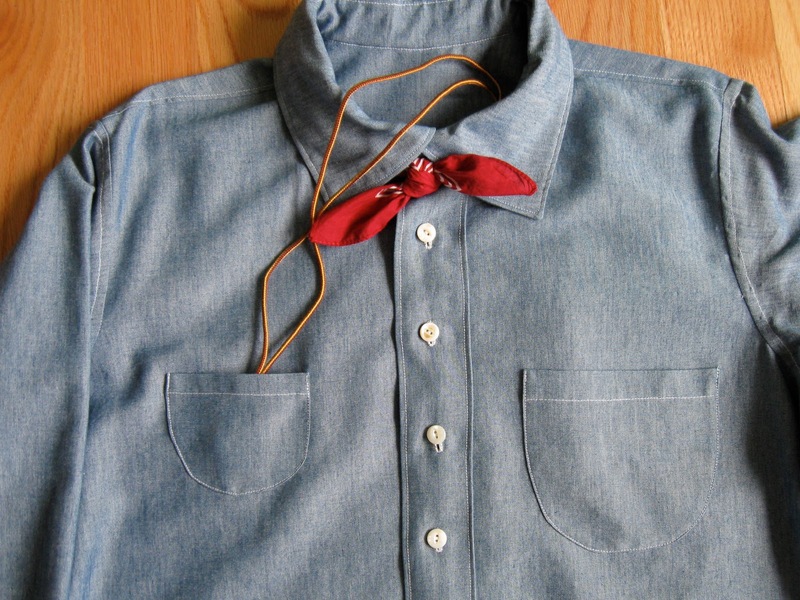 However, I felt that the chambray was a little too heavy to work well for this, so I interlined the collar, neck-band and cuffs with a fairly lightweight unbleached muslin. I have a cheat for doing this. 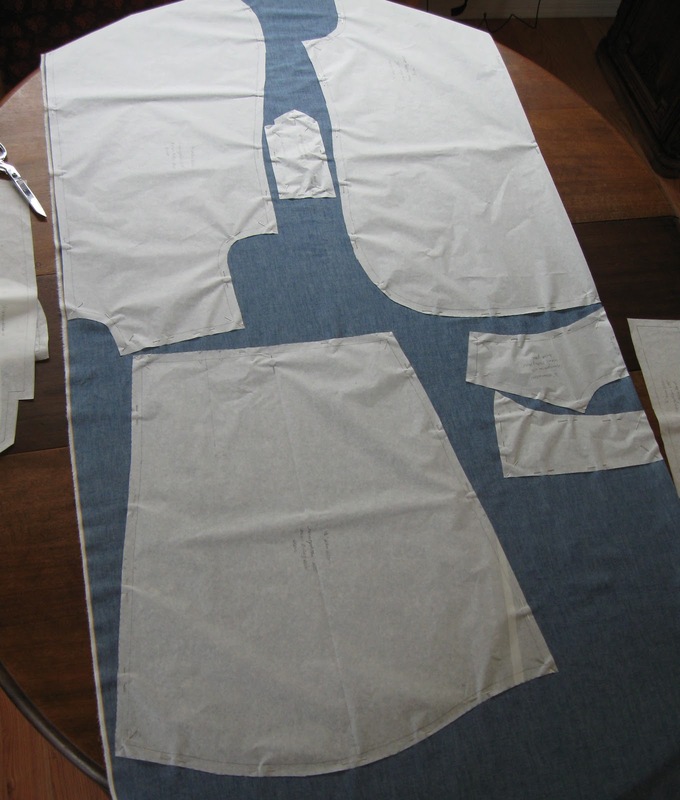 I pin the cut pieces to the muslin rather than the paper pattern pieces. This means that as soon as I cut the pieces out, I'm ready to do the basting. Here I'm ready to pin the collar to the muslin. And here is the completed basting. I don't use a special basting thread. I just examine my thread board for the ugliest color I can find and use that. Honestly, I don't know how I ended up with a spool of bright yellow thread. Using a basting needle makes this a very quick job to do. And now I'm ready to start sewing. As much as possible, I tried to construct the shirt in exactly the order specified in the original instructions. I also wanted to do as much of the sewing on the machine as possible, for both speed and sturdiness. 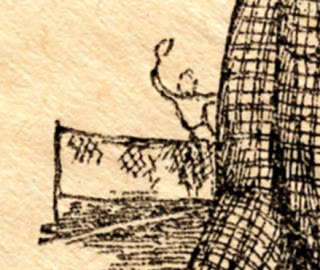 The outing shirt was athletic wear in its time, so it needed to hold up to strenuous activity, such as tennis, which you can just make out being played in the background of the illustration. "Open the front from neck edge as far as single notch and sew the front lap to the left front by notches with the seam on outside, then fold lap over front on line of perforations. 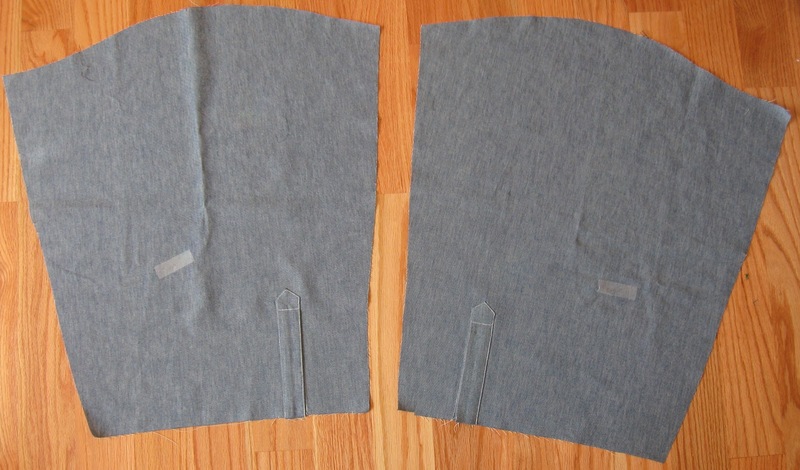 Sew a facing or underlap to the right side of the slash and close the front with button holes. 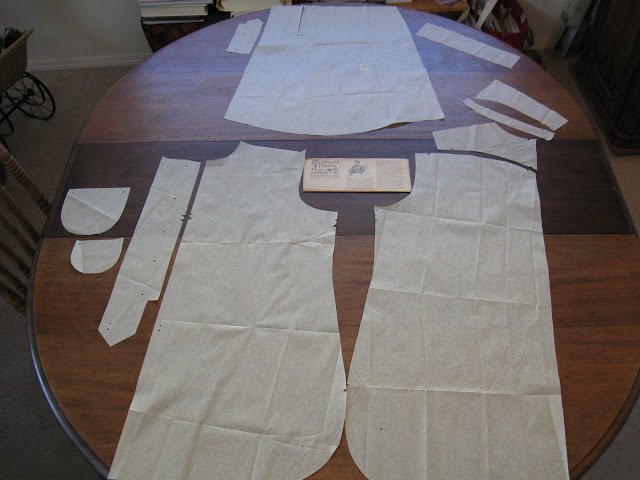 Stitch the pockets to position, placing the large pocket on the left front and the small on right side." There is no pattern piece for the underlap; you're expected to know how to take measurements of the shirt and the neck-band and cut a rectangle of the right size to allow the shirt to close correctly. To give you a sense of proportions, one of my sewing books of about the same period indicates that the front opening should be waist-depth. "Slightly gather the upper edge of back between the notches, sew to lower edge of yoke by notches and join the side seams as far as single notches, finishing the seams with small gussets." In the matter of the yoke I did deviate from the original instructions. I cut a facing for the yoke, both for strength and for neatness of finish on the inside of the shirt. 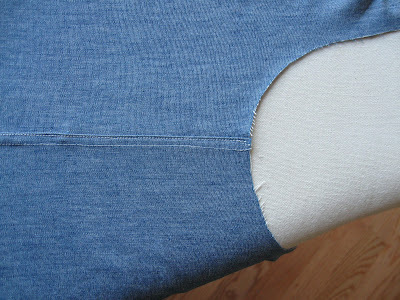 This meant that the shirt back was sewn first to the facing. 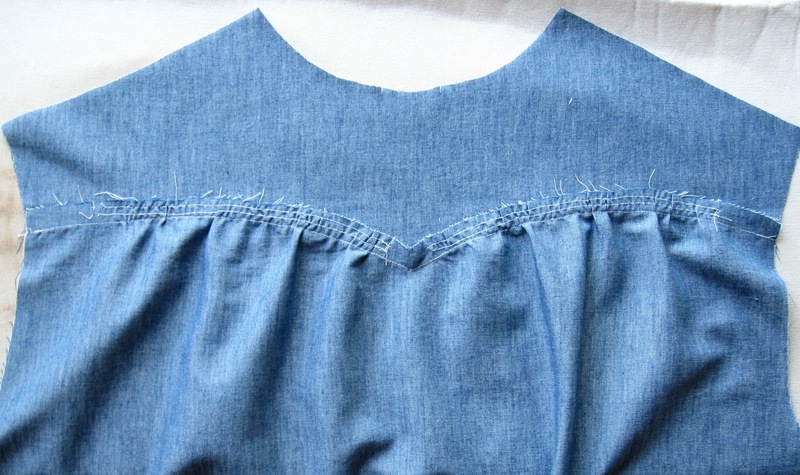 My approach to sewing on the yokes was to turn up on the seam allowances and top stitch to the shirt back. 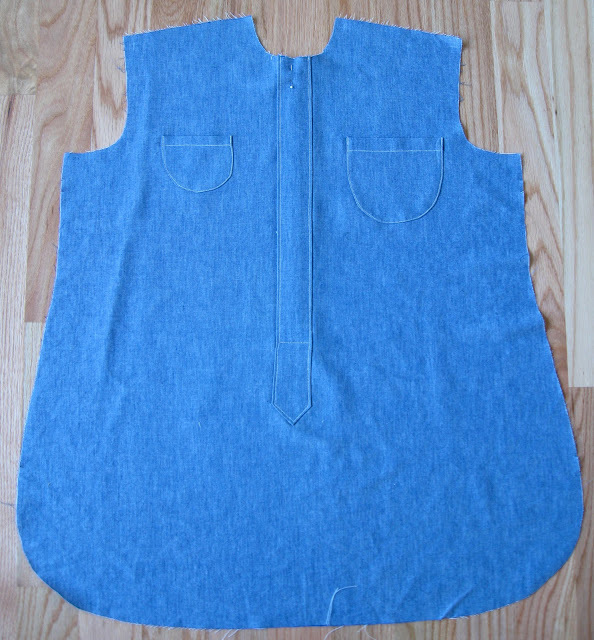 Here is the back sewn to the yoke facing. Unfortunately, I removed the hand-basting stitches before I took the photograph. And here is a close up. The top two rows of stitching are the machined gathering stitches. For both yokes, I machined along the seam line, notched to the line of stitching, and then pressed the seam allowance up. Thus prepared, the yoke was then carefully basted to the shirt before being machine stitched. (Once again, I don't seem to have taken any pictures showing the basting. 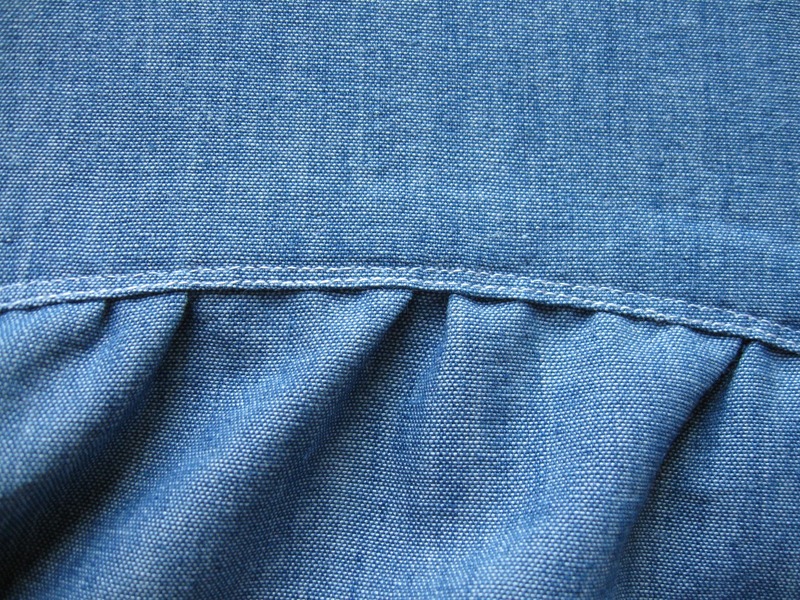 With the exception of the side seams, every seam on the shirt was hand basted before machining.) Here is a close up of the right side of the shirt, showing the yoke edge-stitched to the shirt back. I'm currently using a 1945 Singer treadle machine for all of my sewing. I used a short stitch length throughout the shirt. Here is the wrong side, where the effect is of edge stitching, which attaches the yoke facing to the shirt, and top stitching, which attaches the yoke to the shirt. I was pleased with how well this came out, which I owe to the hand basting. Although I didn't take any pictures of this, I basted the yoke and yoke facing together. This functioned as stay stitching to prevent the neck and sleeve curves from getting stretched. The maker is expected to decide on a seam finish for the side seams. I used a flat felled seam. ...then the tip is turned over to the right side and sewn down. "Sew the lap to slash in sleeve by notches with the seams on the outside, then fold the lap over on line of perforations, stitch to position as indicated by corresponding perforations and narrowly hem the unnotched edge of slash." And here is a fairly uninspiring shot of the newly placketed sleeves. The bits of tape are to indicate the right sides, as I have a real genius for unintentionally making two left sleeves or two right sleeves. "Gather the sleeve on lower edge between the notches and stitch the cuff to lower edge of sleeve." Unfortunately, I took only one picture of this operation. Here you see two rows of pink hand-gathering threads and one row of red thread basting the sleeve to the cuff. You can't see the cuff because at this point it's on the inside of the sleeve. After I sewed it down, I turned it over to the outside on its fold line and edge stitched the cuff to the right side. 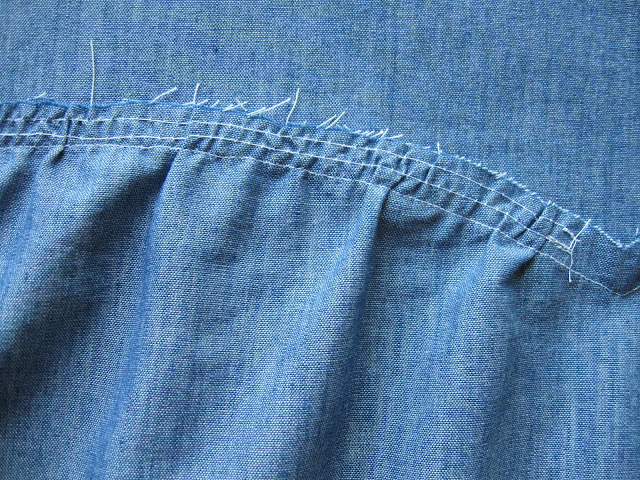 "Sew the arm's eye to sleeve, three-fourths of an inch from the edge of sleeve, placing the seam in sleeve at side body seams (the single perforation indicating the front), and stitch the upper edge of sleeve to position." The 3/4" offset from the edge was a real head scratcher, and I basted in the first sleeve a couple of times before I thought I had it right. What that 3/4" gets you is sufficient material to make a very sturdy felled seam. Again, remember that this shirt is athletic wear, and the sleeve seam can be expected to take a lot of stress. A shirt is ruined if the sleeves pull out, since there is seldom enough sound fabric left to make a repair. One test of a well-made pattern is the accuracy of the sleeve fit, and this pattern passed the test with flying colors. It was at this point I realized that I'd sewn the pockets in far too high, so I reset them a bit lower. "Stitch the collar between the neck-band by notches and the neck-band to neck by notch." It's important to get the collar set correctly because it frames the face and thus gets a lot of visual attention. The band must be centered correctly on the shirt, and the collar must be centered correctly on the band. The collar points should spread symmetrically and be the same length. Collars are not trivial to do well. You're working with relatively small, narrow pieces of fabric that have just enough curvature to make accidental stretching a concern. Once you're ready to attach the collar to the band, you'll be working with multiple layers of fabric and narrow seam allowances. Given the very brief instructions, it was up to the maker to have solid shirt-making skills to guide her to a happy result. On examining the original pattern pieces, I discovered that the neck band extends beyond the collar by 1/2 inch on either side, so at some point I managed to introduce an error, either in inadvertently stretching the collar or in mismanaging my seam allowances. Now that I know that overlap is an error, the solution is to rip out the collar, restitch the front edges and re-apply the collar to the band. In fact, a thrifty, thoughtful maker would have made an extra collar at the same time she did the original construction and stored it away against the day the original collar could no longer be darned or turned. Button placement was not indicated on the pattern pieces, leaving this to the maker. Having a large stash of old mother of pearl buttons, I could afford to be generous with the buttons. I worked the buttonholes by hand. My normal method of working button holes is to work a one-stitch wide box of double running stitch, slash inside the box, and then button hole stitch all around the box, bringing up the thread for each button hole stitch just outside the double running stitches. However, a plain sewing manual of about the same period as the shirt recommended simply overcasting the cut edge and then working the buttonhole stitch, so I decided to give this a try. 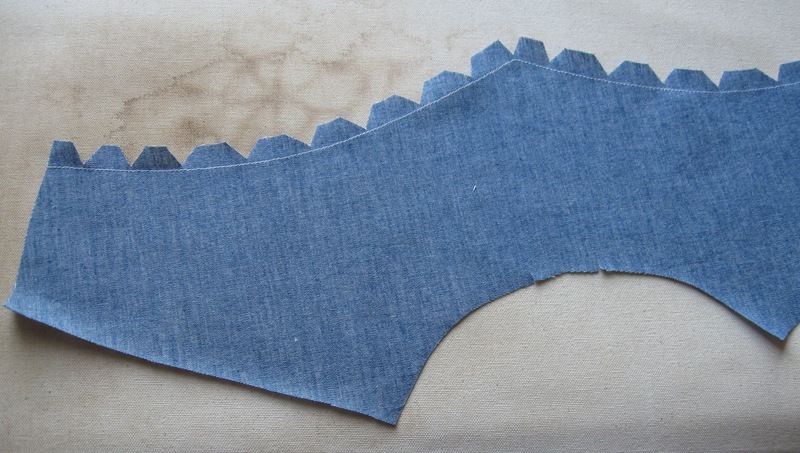 This approach is probably fine for a more firmly woven fabric than chambray, but my results were somewhat uneven. This wasn't helped by the fact that I simply used a doubled sewing cotton (and a fair amount of beeswax) for my stitching, as the only button hole thread I had on hand at the time is part polyester, which I don't care for. Circumference under the arm = 50 1/2"
Neck from center of button hole to center of button = 17 1/8"
Sleeve from center bottom of neck band at back, to edge of cuff = 32 1/2"
Circumference of cuff = 10"
Front length from bottom of neck band = 29 1/4"
Back length from bottom of neck band = 34 1/4"
Length of front placket = 19 3/4"
And what about that little pocket? My guess is that it's a watch pocket. 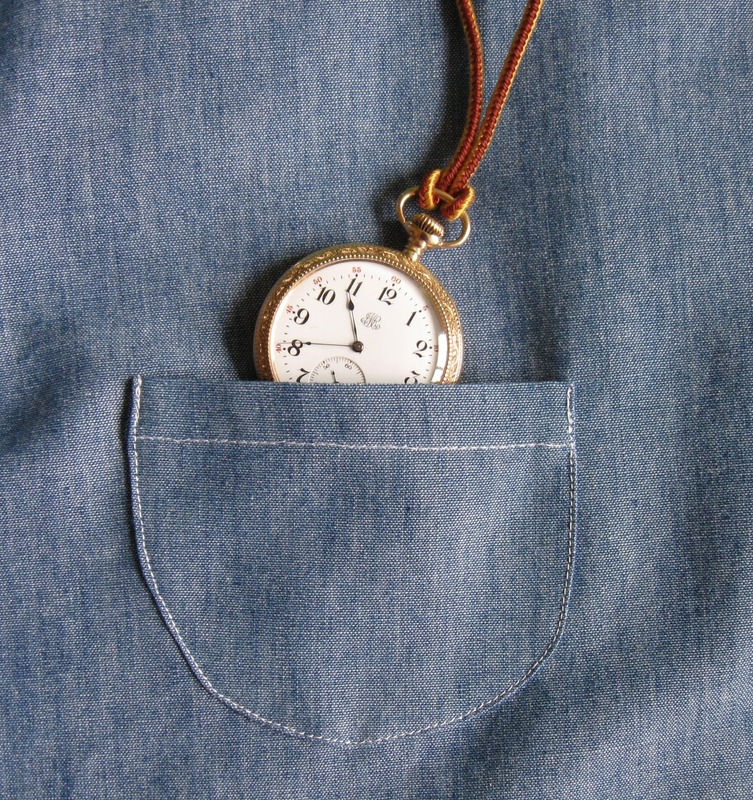 I can tell you from personal experience that it's impossible to get your watch out of a watch pocket set into your waistband when you're seated, so putting this small pocket in the shirt would make the watch accessible while the wearer was seated riding (either a bicycle or a horse are possible for 1898) or in a canoe, for example. Originally posted in 2009, entirely re-written in 2011, following construction of the shirt. I am presently wool obsessed and living outside of pdx, near the pendleton wool mill. i want to get some wool and make some shirts like this. Any idea what pattern I could use. How do these old patterns work? Stephanie - It's a good thing I don't live near the Pendleton mill - I would just be signing over my paycheck to them every week! These old patterns can be hard to work with. 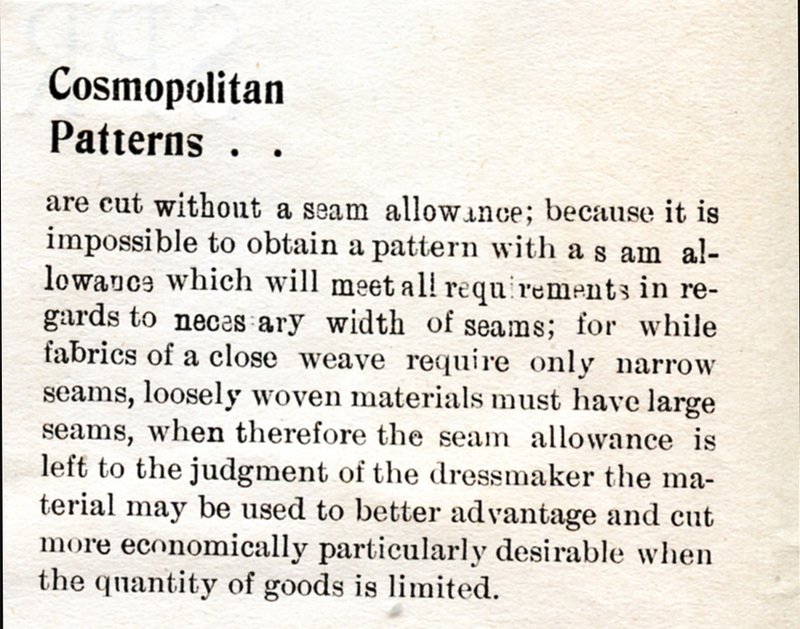 The Cosmopolitan patterns, for example, don't have seam allowances. 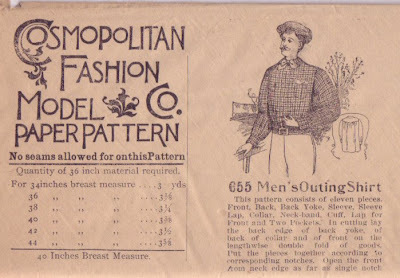 Most patterns weren't printed before the 1950s (McCall and some Pictorial Review patterns being notable exceptions) they were perforated instead to indicate grain lines, edges to be placed on the fold, tuck or pleat lines, etc. Many patterns didn't come with detailed instructions sheets, just some terse instructions on the back of the envelope. The "Big Three" pattern companies do some historically based patterns, but they make concessions for current sewing techniques and ideas of fit, which may be okay for you. You don't mention how much sewing experience you have; please, please PLEASE, unless you're a hotshot sempstress, don't cut into your beautiful Pendleton wool until you've made up your pattern in muslin first.! And be sure to post pictures of your shirts! I just love this tutorial. I've been reticent about working with a vintage pattern without seam allowance but this makes it less daunting. Thanks for the great tutorial and blog. About the leg gussets, they date way back. 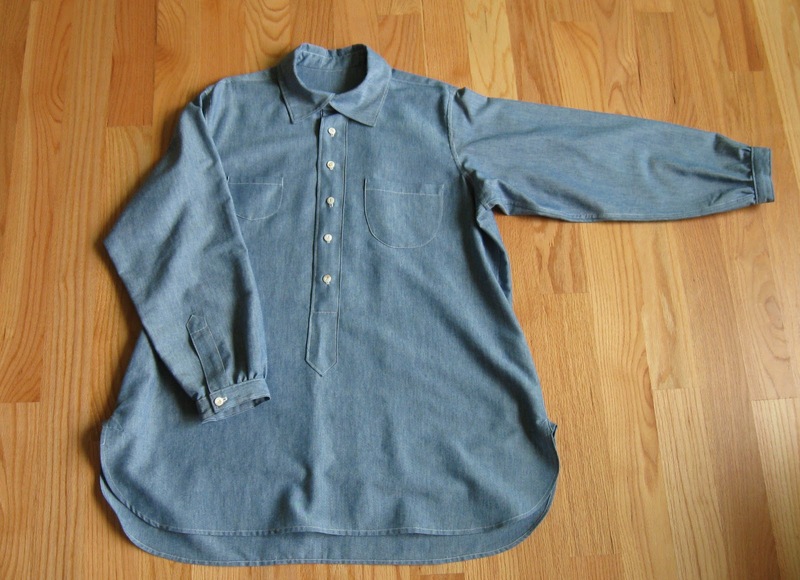 If you get a chance to look at shirts as far back as the Tudor era, (1500's) they have them in the shirts. They probably continued as long as men's sirts were made so long that the seam was stressed by leg movement. she left off a letter, and it could make it hard to get there.